New Frontiers in Discrimination Studies: "Chimpanzees Would Cook if Given the Chance, Research Says"
30 Comments to "New Frontiers in Discrimination Studies: "Chimpanzees Would Cook if Given the Chance, Research Says""
What with men being re-defined as pre-transition women, the only thing left is finding a species that’s good in bed. Let’s see Margaret Atwood write that up, although the much neglected John Collier did it 80 years ago. There was a scientist on BBC WS talking about his research into chimpanzee violence and whether was caused by human interference. He found it isn’t. Chimps are the only animal apart from humans that has war. When chimps kill a member of an enemy group, who they can have grown up with, they like to drink the blood of the victim. (Jane Goodall describes the Gombe chimp ‘war’.) So they probably would roast them if they knew how. Unless you're not counting bugs and vermin. So they probably would roast them if they knew how. There was a scientist on BBC WS talking about his research into chimpanzee violence and whether was caused by human interference. He found it isn't. Chimps are the only animal apart from humans that has war. When chimps kill a member of an enemy group, who they can have grown up with, they like to drink the blood of the victim. (Jane Goodall describes the Gombe chimp ‘war’.) So they probably would roast them if they knew how. Unless you’re not counting bugs and vermin. Well the chimps getting together for coalitionary violence are all male. And they have a special collective walk to show they mean business. And there is a hierarchy that can change over time. Sure, give them a bunch of propane grills, and then wait for the lawsuits filed on their behalf after they burn themselves, and soon after the new chimp-safe grills that we will all have to live with. Can Chimpanzees replace Illegal Immigrants in the fast food industry? I don’t think they really know how to cook. They just monkey around in the kitchen. Chimpanzees would swipe EBT cards if given the chance. Bonobo males don't fight each other or other other groups and are extremely peaceful within their own group, partly because they get fingers bitten off by dominant females for acting up. Male bonobos are in the habit of sexually abusing infant bonobos. Chimpanzees also probably have the cognitive ability to write more interesting clickbait pieces for the mainstream media, if only they were given the chance. OK, who wants to crack the first George Foreman joke? And the first chimp staffed restaurant can truly boast that its food ‘is not touched by human hands’. My late, beloved dog could also cook. When I would make a ham sandwich, instead of eating the proffered doggie biscuit, she would whine and cry until the doggie biscuit was transformed into a slice of ham. In this manner, she could even cook prosciutto ham sometimes, which is certainly no mean feat. How could she afford that? Bonobo males don’t fight each other or other other groups and are extremely peaceful within their own group, partly because they get fingers bitten off by dominant females for acting up. Male bonobos are in the habit of sexually abusing infant bonobos. The differences between chimpanzees and bonobos have been much exaggerated. This is due to the lack of study of the latter in the wild, as well as the misconduct and feministically tinged writings of researchers like the egregious Frans de Waal. Apparently, chimps can drive too, but not very well. They are capable of avoid collisions in light traffic and of obeying traffic signals, but they can’t really do both at the same time. I could see a chimp cooking for a while, but sooner or later he’ll fall back on take-out. The whistleblowers, known as the “Bonobo 12” allege that Savage-Rumbaugh allowed incestuous copulations between apes that had led to an unauthorized pregnancy (and subsequent miscarriage), forgot where she left the apes, locked the apes outside without access to water for hours at a time, and exposed the animals—including the infant bonobo Teco–to people who did not have proper vaccinations, among other instances of dangerous behavior. ... following in the footsteps of Ronald Reagan. Do chimpanzees have the cognitive ability to vote for Democrats, if only someone would give them the franchise? If so, there’s the next great cause to be taken up by the BYT. The whistleblowers, known as the “Bonobo 12” allege that Savage-Rumbaugh allowed incestuous copulations between apes that had led to an unauthorized pregnancy (and subsequent miscarriage), forgot where she left the apes, locked the apes outside without access to water for hours at a time, and exposed the animals—including the infant bonobo Teco--to people who did not have proper vaccinations, among other instances of dangerous behavior. … following in the footsteps of Ronald Reagan. I would enjoy a 100 million dollar mansion if given the chance to enjoy it. Well, finally someone in the no good media has found a way to keep those evil Capitalists from replacing us all with robots! Its chimp labor! 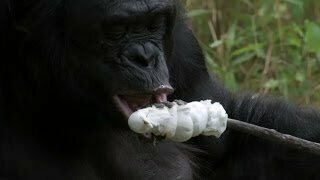 All we have to do is train these apes to do all the jobs we can’t get cheap labor to perform and keep our lower standards of living. We can round them up and they can do all the labor for us! Say, why does all of this sound familiar? Just keep them away from guns, though. You just can’t trust those damn dirty apes with guns! Don't give them any ideas... "Jobs Homo sapiens won't do... Family values don't stop at the zoo perimeter," etc. Well, finally someone in the no good media has found a way to keep those evil Capitalists from replacing us all with robots! Its chimp labor! All we have to do is train these apes to do all the jobs we can't get cheap labor to perform and keep our lower standards of living. We can round them up and they can do all the labor for us! Say, why does all of this sound familiar? Just keep them away from guns, though. You just can't trust those damn dirty apes with guns! Don’t give them any ideas… “Jobs Homo sapiens won’t do… Family values don’t stop at the zoo perimeter,” etc.